Peppa and George are going on an Easter egg hunt. Peppa is psyched. She wants to find eggs in every color, so she and little brother George set off on the hunt, Peppa with a basket and George with a net! Whoever hid all the eggs meant for them to be found. In no time Peppa has almost met her goal when the two of them arrive at a field with tall, tall grass. How will they spot Easter eggs in there? His big mower will cut that grass fast!" Back and forth he goes. "Do you know what happens when it's sunny and rainy at the same time?" asks Mother Pig. "I know!" said Peppa. "You get a RAINBOW!" Red, Orange, Yellow, Green, Blue, Indigo, Violet! And what better way to learn the order of the colors of the rainbow than a jolly Easter egg hunt, in Peppa Pig and the Easter Rainbow (Candlewick Press, 2017). 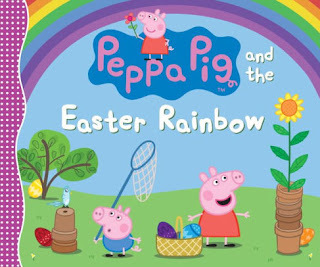 Neville Astley's popular preschool TV star Peppa Pig is always teaching George and all the youngsters who get to share her stories, and this one cleverly combines a lesson on colors and weather phenomena with Easter egg hunting. Share this one with Peppa's Easter Egg Hunt (Peppa Pig) for a perfect pair, eggs-zactly right for kids who can't wait to find those Easter eggs wherever they may be.